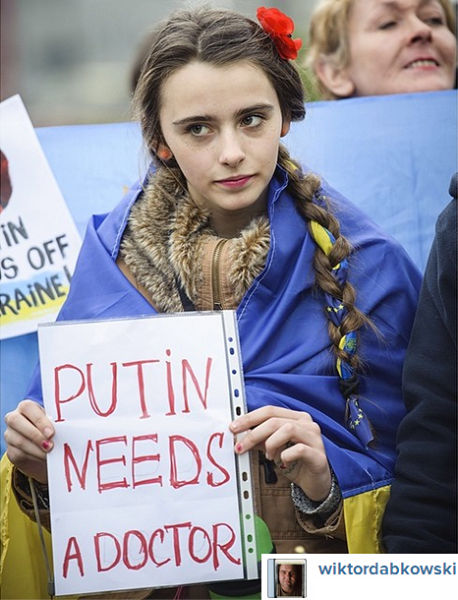 It is 24 hours since the “result” of the referendum in Crimea. There was no surprise there, and today the region was recognised as independent by the Russian state. The result in Brussels and Washington and London has been somewhat different. The consequence of everything Western politicians have said about the referendum’s illegality, about the costs Putin will have to pay for backing it, about the “dangerous game” he is playing, has been summed up in today’s decision to institute asset freezes and visa bans on 21 officials who played a direct part in organising the Crimean vote. And that is all. Personal, negligible sanctions against 21 individuals for an action that is the culmination of invasion, the use of troops without insignias, military blockades, civilian intimidation, media censorship, violence, lies, the laying of minefields and the seizure of territory, the theft of national assets, and the murder of those who opposed any of it. Now, elsewhere on Ukraine’s eastern borders, at least 3 Russian divisions are gathering and the Russian president has “expressed concern” about unrest in that part of the country, unrest that can only – so the implication is to be understood – be calmed by Russia’s further intervention and occupation of the troubled areas. Unrest that it is clear has been orchestrated by Moscow. Do the frowning suits in Brussels and Washington really think President Putin is to be stopped by piecemeal sanctions? That he can be persuaded to withdraw by diplomacy and reason? That his intentions will be deterred by the stern disapproval of President Obama, Chancellor Merkel and David Cameron? Nothing, absolutely nothing in the last 3 weeks suggests that they will. So, what direction should the combined efforts of Western foreign policy be moving in? The answer – the only answer – is a direction that will match Putin’s own force, timing and resolve. Anything less, and as far as he is concerned, he remains ahead. Diplomacy and reason are pointless: while pretending to continue to engage in both, he moved beyond them with his first planeload of badge-less Russian infantry pretending to be “self-defence militias”. As I wrote in a magazine article last week (New Statesman, 14 March), we also have specific agreements to defend Ukraine’s sovereignty – the 1994 Budapest Memorandum on Security Assurances and the 1997 NATO Charter on a Distinctive Partnership – and the only way to persuade Putin to draw back “is to show that honouring our guarantees means more to us than the cost of doing so”. That means action. Action beyond sanctions and words. There is no other way now, much as we may have minimal stomach for it after our expeditions to Iraq and Afghanistan. Now there must be action, a balancing threat of military involvement which will make Putin finally recalculate the odds in his gamble that the West will not take him on. The Ukrainian Navy is blockaded by the Russian Black Sea Fleet in Crimea. Very well, the Black Sea Fleet must be blockaded by a NATO naval force. Three Russian divisions are waiting on the eastern borders of Ukraine. Then NATO and the EU must move to send 3 divisions of its own, with air cover, armour and artillery to eastern Ukraine to face him down. As I’m writing this, the Russian deputy prime minister has dismissed sanctions as “the work of a joker”. He is right. Anything less than action now is a joke. There is no stopping the onward march of Putin’s expansionism except by the visible and physical threat of force. As I write, I am doubly disgusted: disgusted by the cynicism of a Russian president, a last relic of an ideology-less, value-free era when communism had been discredited but nothing had yet taken its place in the USSR, so that all that mattered was selfishness and venality, and disgusted too by the timid, calculating, mealy-mouthed, pointless response of the British government and the governments of its allies who supposedly represent the values I believe in but don’t have the courage or determination to defend them. I rarely bother to feel much emotion about the actions of politicians – I’m also not entirely devoid of cynicism – but in this turning point in Europe’s history, certainly the most important moment I’ve lived through in my adult life, I am ashamed. Ashamed of my elected representatives. Ashamed of Europe. Ashamed at the West’s short-termism. Ashamed of its stupidity, even. Because there is one huge factor remaining to be taken into account, and that is how the nation of Ukraine will feel in future about a Britain, a Europe, a US, a NATO that promised to uphold its sovereignty and then, pleading inconvenience, failed to keep that promise. I don’t give much for our chance of future friendship with that nation if we do fail to keep our promise. Nor, in that case, do I give much for the chance of peace in Europe in the next 50 years.